1992’s A League Of Their Own pulls off one of the most difficult tricks in filmmaking. While it clearly falls into the category of stereotypical "chick flick," it nonetheless manages to be a thoroughly entertaining and satisfying film for the males in the audience - even for a raging he-man such as myself! Much of the credit for this accomplishment falls at the feet of director Penny Marshall, as she ably transferred all the lessons she learned in front of the camera as a fine comedic actress in fare such as Laverne and Shirley and The Odd Couple to her work as a director. Here and in Big, Marshall displays a skill for maneuvering through scenes both comic and dramatic with a deftness that many directors lack. A League Of Their Own follows the standard route most sports films take in that we observe our team through a season that inevitably builds toward a championship contest. One difference between this film and many relates to the fact that when we finally get to that "big game," we don’t feel completely sure for whom we should cheer. That's because the film's main storyline involves the sibling rivalry between naturally successful Dottie (Geena Davis) and younger sister Kit (Lori Petty), who struggles to escape from Dottie's shadow. Tensions between the two simmer and eventually boil during the course of the movie, and though they spend much of the season as teammates, Dottie inadvertently gets Kit traded right before the World Series – and Dottie’s Rockford Peaches face Kit’s new team plays them. Normally, we would root for the Peaches, the squad we follow the whole film. Since Kit's now on the other side, however, this makes our choice more complex. In the end, League manages to have its cake and eat it too. Only one team can win, of course, but the conclusion works in such a way that the audience feels content with the ending. Again, this finale to the season not only could have failed but probably should have failed, as any time a film seeks to placate all sides of an issue, it usually bombs. This situation succeeds because Marshall makes it work. She maintains the scene with a light enough touch that the entire circumstance seems natural. I can’t overstate the subtlety with which Marshall directs most of League. As a "woman's film," A League Of Their Own stood a terrific chance of falling into many of the traps that befall a lot of efforts from the genre. Many of those movies telegraph their emotions, and the characters tend to wallow in melodrama. That doesn’t occur here. Although the theme that “it's hard for a woman to make it in a man's world” persists throughout the film - and each main character gets a scene in which she tells her little side of that struggle - these bits are brief and well integrated into the action. Marshall also escapes that trap in regard to the sibling rivalry theme that runs through the film. It presents a refreshing lack of touchy feely scenes in which the sisters "explore their feelings" and try to accommodate each other. We clearly understand both of their perspectives, and we can also empathize with both characters. Dottie's clearly unwilling to roll over so Kit can succeed in a phony way, and although she may maintain a little too much intensity - Dottie's ultra-competitive - she maintains the proper attitude, as success should be earned, not given. Davis grounds Dottie with a high level of pragmatism and determination, and she never comes off as nasty or petty, both of which become dangers for the role. Still, we also feel for Kit, since virtually everyone knows what it's like to be stuck in the shadow of someone more skilled. Petty plays the little sister with enough determination and grit that although her character definitely could have seemed like a simpering crybaby, she never falls into that trap. Really, the only elements of this film I find unnecessary and overly sentimental are the contemporary bits that frame the movie. For a few minutes at both the beginning and ending of A League Of Their Own, we witness “modern-day” Dottie as she goes to a reunion of female ballplayers that takes place at the Hall of Fame. The meat of the film actually comes as a flashback in which an older Dottie (Lynn Cartwright) reminisces about those long-ago days. While the present-day bits don’t seem bad, I simply think that they we don’t need them. These prolong the film without much reason and they add little to the movie's emotional impact. Sometimes it's fun to see what happened to the characters in later years, but nothing here tells us much of interest. The top-level cast combines with Marshall's succinct direction to make A League Of Their Own a winner. In addition to Davis and Petty in the lead roles, Tom Hanks does some of his best work as bitter drunken ex-ballplayer Jimmy Dugan. In a role loosely based on real big leaguer Hack Wilson, Hanks provides many of the film's comic sparks, but he doesn't allow his character to degenerate to the level of simple clown. Hanks manages to convey the lost pride inherent in his fallen hero, and we truly believe and accept the growth the character displays. This wasn’t a part that would gain Hanks Oscar consideration, but it’s one of his best performances – and better than the roles for which he did earn Academy love. Madonna makes a rare appearance in an actual good movie, and she offers a memorable turn. I'm very much in the bag for Madonna, but only as a musician, not as an actress. With rare exceptions, her film work has been dreck. Those exceptions seem to occur only a) when she works in comedic roles; and b) when she's there only as a supporting actress, not as the star. A League Of Their Own clearly matches those criteria. It's tempting to add that Madonna also needs roles that don't stray far from her personal image, since her best-realized pieces tend to stay pretty close to home. However, that's not the case; acting as a sexually provocative character in Body of Evidence sure didn't help. A League Of Their Own works tremendously well as both comedic and dramatic fare. It’s a movie that both men and women can enjoy and it charms from (almost) start to finish. A League of Their Own appears in an aspect ratio of approximately 2.35:1 on this Blu-ray Disc. Despite a few minor lapses, this was usually a solid transfer. Sharpness mostly seemed fine. Occasional wide shots came across as a little ill-defined, but those examples occurred infrequently. Instead, most of the flick was nicely detailed and concise. I saw no issues with jagged edges or shimmering, and edge haloes weren’t a factor. I didn’t sense any digital noise reduction, and print flaws never marred the presentation. Colors seemed solid, as despite the period setting, the film kept the hues natural, and they consistently looked vivid and dynamic. The tones were nicely rich and seemed quite distinctive. Blacks were deep and firm, and most low-light shots came across well. The mild softness made this a “B”, but I still felt satisfied with the image. The movie provided a serviceable DTS-HD MA 5.1 soundtrack in which the front channels offered a decent sense of atmosphere. Music showed good stereo imaging, and the track came to life in a gentle way when necessary. The ballgames provided a nice feeling of environment, and louder scenes like the dance at the gin joint also brought us fair involvement. The track lacked great scope and could have used some stronger surround ambience, as the rear speakers rarely did more than support music. A couple of scenes used them a little more actively, but don’t expect much from the back channels. Audio quality worked well. Speech seemed natural and concise, without notable edginess or other concerns. Effects appeared accurate and clean, as they lacked distortion or other concerns, and music was full and rich. This wasn’t a dazzling auditory presentation, but it was adequate for the film. How did this Blu-ray compare to the last DVD from 2004? Audio was richer and more involving, as the DVD included no surround information – literally, as it opted for a 3.1 presentation that eliminated the back speakers. Visuals were tighter, cleaner and more dynamic. 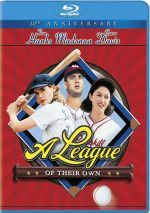 League has had a spotty history on home video, and this Blu-ray provides a good version. The Blu-ray replicates most of the last DVD’s extras, and we launch with an audio commentary from director Penny Marshall plus actors Lori Petty, Megan Cavanagh and Tracy Reiner. All four sit together for their running, screen-specific track. While not a terrific piece, this discussion seems generally informative and entertaining. Not surprisingly, Marshall dominates as the quartet addresses topics connected to the movie. Among other things, they go over training for the actors, elements shot but not used, Marshall’s directorial style, casting, and dealing with various logistical challenges. The three actors mostly toss in anecdotes from the set, many of which deal with Madonna. At times, we get some generic happy talk, and Marshall often tends to just tell us the names of participants. Nonetheless, the conversation moves briskly and offers a mostly fun look at the movie. We find a lot of that cut material Marshall mentioned in the package’s 15 deleted scenes. We can watch these with or without introductions from Marshall. With the intros on, the entire set of snippets runs a whopping 36 minutes, 56 seconds. Some excellent material appears here, as we find a mix of extensions to existing scenes plus many that don’t exist at all in the final film. Many of them are quite funny, and we get segments that also elaborate on the sexual tension between Jimmy and Dottie. We find out the real reason Dottie cried after Betty’s husband got killed and see many other nice moments. It’s a fine collection of clips. Marshall’s introductions mostly just set up what we’re going to see. Sometimes she gives us specific reasons for the deletions, though she implies the majority got the boot due to time reasons. The introductions don’t add a lot, but they’re short, and they’re informative enough to merit their use. The disc’s other major extra presents a documentary called Nine Memorable Innings. It should come as no surprise that the program splits into nine chapters plus “pre-game” and “post-game”; via the “Play All” option, it runs 52 minutes and 27 seconds. “Innings” includes notes from director Penny Marshall, writers Lowell Ganz and Babaloo Mandel, and actors Lori Petty, Tracy Reiner, Geena Davis, Rosie O’Donnell, Garry Marshall, Tom Hanks (from 1992), Jon Lovitz, David Strathairn, and Madonna (from 1992). The program goes through a number of subjects. We learn about the films background and research, its path to the screen, casting, training, costume issues, shooting the baseball sequences and other notes from the set, Marshall’s approach and personality, anecdotes about the various actors, working with the older actors, and general reflections. The tone seems fairly thin and fluffy, but a reasonable amount of good information appears. The mini-chapters go through the material fairly efficiently and it all goes down painlessly. I’d prefer less happy talk, but this remains a decent documentary. Next we get the music video for Madonna’s “This Used to Be My Playground”. The song’s not exactly Maddy’s crowning achievement, but for a sappy ballad, it’s not bad. The video’s also decent but not better, as it presents lip-synch clips from Madonna as part of a photo book. It’s a moderately clever execution of a standard format. It also tosses in some movie clips just like almost every other “music video for a song from a film” ever made. Does the Blu-ray drop any extras from the last DVD? Yup – it loses filmographies and a trailer. Those aren’t fatal losses, but it’s too bad the trailer doesn’t reappear here. How can you resist a movie in which a character autographs a baseball with "Avoid the clap - Jimmy Dugan"? I can’t. A League of Their Own presents a terrific film that works for a wide variety of audiences. The Blu-ray delivers good picture and audio along with a fairly satisfying package of bonus materials. This is a charming movie that holds up well after 25 years.